The first Desktop type prototyping machine with a 50 micron line/spacing in the world! Watch the introduction movie of FP-21T Precision right now. FP-21T Precision employs small degree of runout spindle motor as well as low center of gravity and high rigidity designing. This is the ideal model for the microfabrication. We achieved the 50µm line and space for milling processing. In order to process with the fine and fragile tools, we elaborated the Z axis control. This enabled us to accomplish the 50 µm line and space for the first time in the world as the desktop PCB prototyping machine. Compared with the laser machine, FP-21T Precision is superior in cost performance. As an option, there is a method to fabricate 50µm line and space with the laser machine; however, following problems are tied also. Expensive price From the above, our company does not support laser prototyping. As the board is pressured by air pressure, it leaves no undesirable traces on the board surface. Suitable for milling the soft substrate board such as teflon circuit board. When making boards with fine patterns, we usually adopt the incremental milling method in which the material board is held down and the tool tip is made to stick out accurately from the very point where the board is being held down. For holding down the material boards, there are two methods called the contact method and the non-contact method. As the jet of air pushes down the board without touching, this system leaves no trace on the copper foil. Therefore, this system is suitable for the processing of thin or soft board materials. However, additionally you have to have an air compressor. It can see the processing method when milling on a thin board with 50µm track width. Optional equipment makes it even more accurate processing. The vacuum table made of the porous ceramics enables you to process substrate board whose thickness is less than 200µm. Vacuum table (VTP-CRM) Generally, the material of the vacuum table is made of plastic. 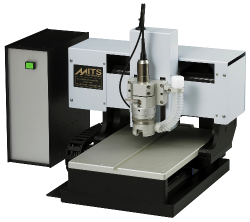 However with the ever increasing demand for processing on the material thinner than 200 µm, MITS has successfully developed the porous ceramic vacuum table whose flatness accuracy is 10 µm. The option replaces the standard table itself with the vacuum table of extremely high flatness. Fiducial camera Position adjustment can easily be done by magnifying the substrate surface accurately. Machine dimensions W x D x H (mm) Machine: 415 x 500 x 375 (16" x 20" x 15"